With traditional appeal, this builder-friendly design starts with a eye-catching stone and siding exterior. Columns make a dramatic entry, while custom-styled features such as a fireplace, French doors and cathedral ceiling add casual elegance. 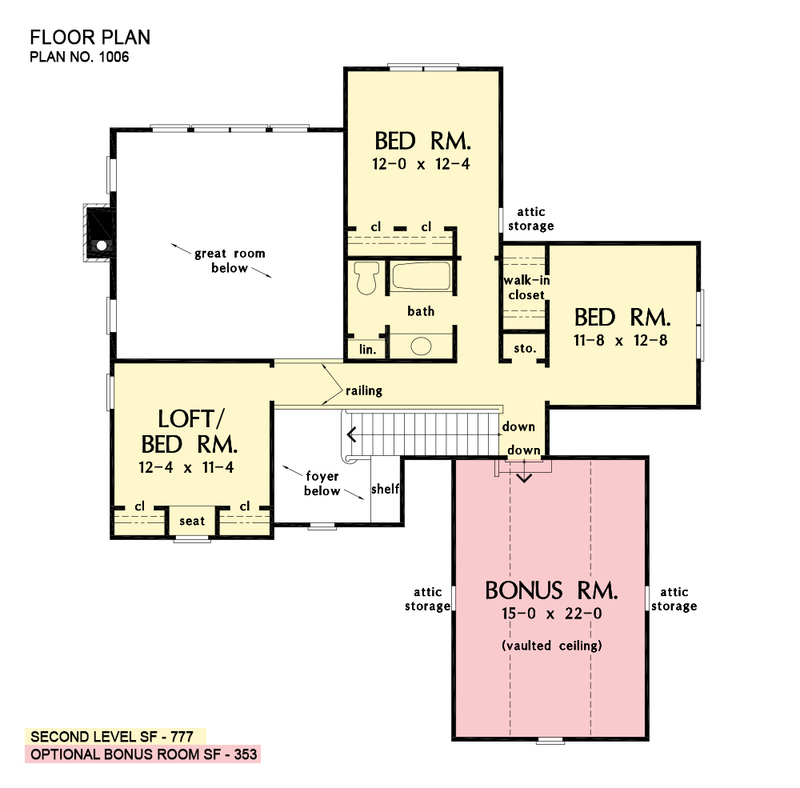 Upstairs, a loft/bedroom and bonus room offer versatility. Note the large utility room and closet storage. 1st Floor: 1648 Sq. 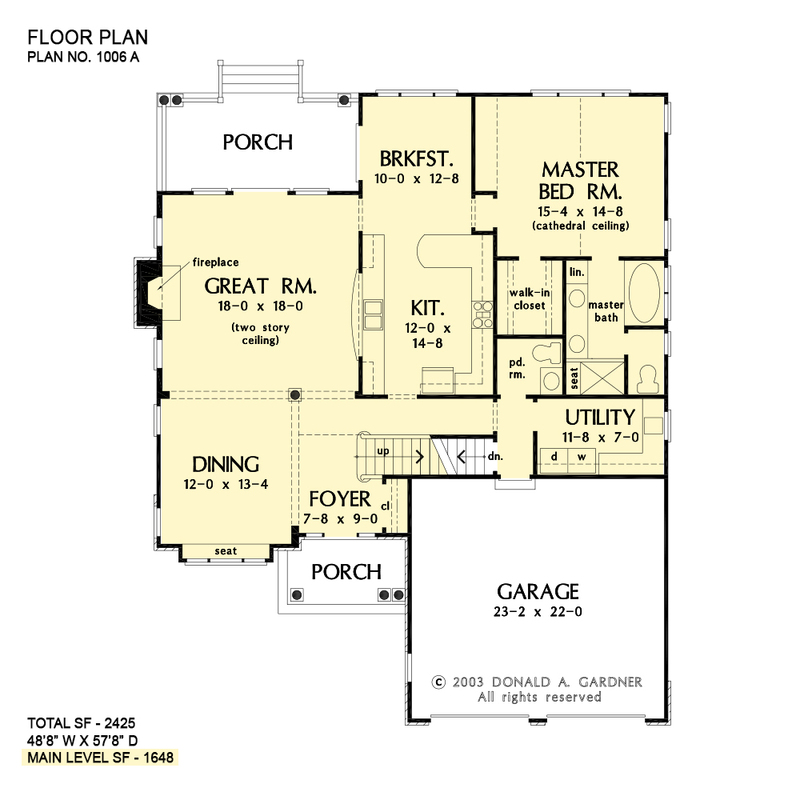 Ft.
House Dimensions: 48' 8" x 57' 8"
Master Bedroom: 15' 4" x 14' 8"
Porch - Rear : 18' 6" x 9' 0" x 9' 0"
Storage (1st Fl.) (Sloped): 6' 8" x 3' 4" x 0' 0"
Porch - Front : 10' 0" x 6' 0" x 9' 0"
Foyer (2 Story): 7' 8" x 9' 0" x 18' 0"
Great Room (2 Story): 18' 0" x 18' 0" x 18' 0"
Kitchen : 12' 0" x 14' 8" x 9' 0"
Breakfast Room : 10' 0" x 12' 8" x 9' 0"
Utility Room : 11' 8" x 7' 0" x 9' 0"
Bonus Room : 15' 0" x 22' 0" x 9' 5"
Garage : 23' 2" x 22' 0" x 0' 0"
Master Bedroom (Cathedral): 15' 4" x 14' 8" x 14' 0"
Bedroom #2 : 12' 4" x 11' 4" x 8' 0"
Bedroom #3 : 12' 0" x 12' 4" x 8' 0"
Bedroom #4 : 11' 8" x 12' 8" x 8' 0"